Some say the crisis began in the early 2000s. The Joint Commission on Accreditation of Healthcare Organizations had issued new standards for pain management, reframing pain as the “fifth vital sign.” It was to be assessed and monitored as thoroughly as blood pressure and breathing. The standards also stated that, despite clinicians’ concerns about prescribing opioids, there was no evidence that addiction was “a significant issue” with these medications. New, FDA-approved formulations of extended-release and immediate-release opioids such as morphine, fentanyl, oxycodone and hydromorphone became available, and clinicians began prescribing opioids more broadly and frequently. Others trace the problem back to the late 1980s and ‘90s, when the idea that pain was often undertreated began to develop. 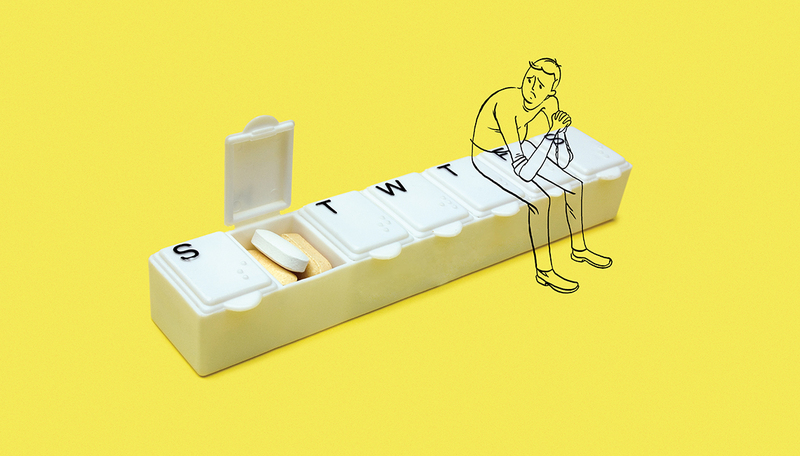 Pain societies lobbied for the use of opioids to treat all pain, and Purdue Pharma began marketing long-acting OxyContin as a safe solution for chronic pain. By 2011, the Centers for Disease Control and Prevention, or CDC, declared the misuse, addiction and overdose of opioids an epidemic. Opioid prescriptions have quadrupled since 2000, and the CDC estimates that prescription pain medication overdose kills 78 Americans a day. The American Society of Addiction Medicine has reported that opioid overdose has now surpassed car accidents as the leading cause of accidental death in the U.S., and four in five new heroin users start out misusing prescription painkillers. Addiction to opioids often begins when a person develops a tolerance for and then becomes physically dependent on their medications when taking them as prescribed, only to develop problems as a result. As the epidemic rattles through America’s health care system, its neighborhoods, its news feeds and its legislative sessions, researchers, clinicians and policy makers are collaborating to mend this self-inflicted wound. In May, President Obama proposed a budget of $1.1 billion in funding for states to expand access to medication-assisted treatment for opioid use disorders — these medications include methadone and buprenorphine, which help reduce cravings and withdrawal symptoms. The funding would also expand access to substance-abuse treatment providers, evaluate current treatment programs, expand state-level prescription drug overdose prevention strategies, improve access to the overdose-reversal drug naloxone, and support targeted enforcement activities. The solutions may seem straightforward — education, prevention, policy change, cut down the pill count, decrease the death toll. But researchers and clinicians at the University of Michigan and beyond are beginning to understand the nuances of this epidemic, the complications that have settled deep into cracks stretching across the full spectrum of health care. They are defining the problem in new and more meaningful ways. And they are discovering the breadth of the approaches required to break through. Around the same time the CDC named opioid misuse an epidemic, Amy Bohnert, Ph.D., a U-M research investigator also at the Department of Veterans Affairs Center for Clinical Management Research, or CCMR, published a study in JAMA linking opioid overdose deaths to patterns of physician prescribing. Using a large national sample of Veterans Health Administration, or VHA, patients, it was the largest study exposing the relationship between prescribing and overdose death. The issue is personal for Bohnert. While finishing her dissertation, she learned that a friend had died of an opioid overdose. She could see in emerging national data that her loss was part of a much larger trend. 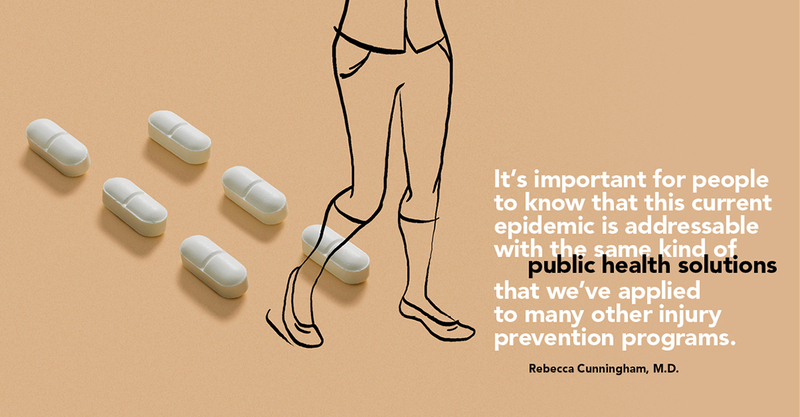 Access to big data has allowed Bohnert and her U-M colleagues to continue their unique work in documenting opioid use trends. In addition to the mortality data provided by the VHA, the IHPI has partnered with United- Healthcare to purchase the OptumInsight database, which contains large health system claims data from 2001–2015 for all 50 states. In follow-up studies commissioned by the CDC, Bohnert ultimately determined that avoiding opioid prescription strengths above 90 Morphine Equivalent Milligrams, or MEM, a day, could benefit those most at risk of an overdose, without affecting patients who aren’t at risk. The CDC then tapped her to join the Core Expert Group for the development of new prescribing guidelines for opioid painkillers, released in March 2016. The national guidelines, created predominately for primary care physicians and providers prescribing opioids for long-term use, outlined specific cautions for safer prescribing. Morphine Equivalent Milligrams (MEMs) The maximum opioid prescription strength to benefit those most at risk of an overdose without affecting patients who aren’t at risk, according to Bohnert. Over the coming year, the U-M Injury Center will advance education and outreach efforts to ensure those guidelines reach practice, says Rebecca Cunningham, M.D., director of the center and professor of emergency medicine and of behavioral health education. The Injury Center, one of nine centers nationally tasked with injury prevention by the CDC, has made prescription overdose prevention a priority. The center supports individual research on interventions, policy and dissemination, and is helping to align the Medical School curriculum with safer prescribing. Most recently, the center funded a pilot study, conceptualized and led by Bohnert, on a therapy-led intervention for adults who came to the ED for prescription drug overdose. “This is the first randomized trial of overdose prevention to be published, and the results indicated that this is a really promising approach,” Bohnert says. The 30-minute motivational intervention was delivered by a therapist to ED patients who had a high risk for opioid overdose. Those who received this intervention had lower levels of opioid misuse and lower levels of overdose-risk behavior six months after they came to the ED than people in the control group. Mark Ilgen, Ph.D., associate professor of psychiatry and a member of IHPI, has also been testing therapy-based interventions. He works with a specific subtype of patients — those struggling with both substance abuse and chronic pain. Ilgen recently published a randomized trial of a psychotherapy-focused pain intervention for adults receiving substance-use disorder treatment at the Ann Arbor VA. The intervention is called ImPAT (Improving Pain During Addiction Treatment), and it employs behavioral-based strategies for pain management without substance use. The trial found that ImPAT approaches reduced pain and alcohol use while improving patients’ day-to-day capabilities over 12 months compared to a control intervention. Ilgen says he hopes to replicate the findings in follow-up studies and will continue to research solutions that can steer people toward living more meaningful lives, in addition to avoiding death. Paul Hilliard, M.D. (Residency 2008, Fellowship 2009), assistant professor of pain management anesthesiology, faces a problem inherent to the practice of anesthesiology: He has very limited opportunity to help optimize patients for surgery before they arrive in the operating room. But surgeons count on him to manage those patients’ pain during the perioperative period. When patients who are already taking high doses of opioids come in for surgery, controlling their pain becomes a challenge for anesthesiologists. Many times, the opioid-based medications used to treat acute surgery pain don’t work as well. “Or they do work, but now you’re up against the limit where you start to see side effects and it becomes dangerous,” says Hilliard, who also sits on Michigan Gov. Rick Snyder’s Advisory Committee on Pain and Symptom Management. In collaboration with one of his fellows, Hilliard created the High Dose Opioid Taper Initiative to help referring physicians, and physicians within U-M, identify patients on high doses of opioids before they get to the operating room. Based on daily opioid dosing, patients can be identified as “high-risk” — for uncontrollable post-op pain, respiratory depression and other complications — by the surgical team. The idea is that cooperation between prescribers and anesthesia and surgical teams can improve safety and efficiency around pain management before, during and after surgery. Hilliard has proposed a study design on this topic and recently secured a grant through the Injury Center. He has also developed a website where opioid prescribers can access information and resources to taper patients safely, including a quick reference guide for how much of each medication adds up to the 90 MEM-a-day threshold. Hilliard has led talks with various U-M departments to raise awareness about the initiative and online tools, particularly within the U-M preoperative clinic at Domino Farms. U-M surgeons and anesthesiologists are also building studies around preventing opioid misuse after a surgery. The vast majority of people who become dependent on prescription opioids receive their first dose following surgical care, and surgeons prescribe nearly 40 percent of all outpatient opioid medications. With 53 million surgeries in the U.S. every year, and the chances of a patient being dependent on opioids three months after surgery at 5 percent, 2.5 million Americans become newly opioid-dependent each year. Waljee, Chad Brummett, M.D. (Residency 2006), assistant professor of pain medicine, and Mike Englesbe, M.D. (Residency 2004), associate professor of surgery in the Section of Transplantation Surgery, are working on a preventive model to curb these numbers. The Michigan Opioid Prescribing Engagement Network, or Michigan-OPEN , an IHPI strategic initiative, aims to reduce excess perioperative opioid prescribing, post-operative use and unintended opioid distribution into local communities. The project is in its early phases. Without causing patients to suffer, the team hopes to inform post-operative prescribing so that prescribers are giving enough medication to allow patients to recover without leaving extra pills in their cabinets. Brummett says that the team is working to describe a standard for appropriate postoperative prescribing for as many surgical procedures as possible. In the meantime, they have been partnering with local law enforcement to host local pill recovery drives. Opioids are infamously difficult to dispose of — hospitals and pharmacies won’t take them back, and most people are unaware that the Sheriff’s Office is the only place in Washtenaw County that will. Some people believe their only option is to flush their pills, which creates environmental concerns about opioids entering the water system. The most recent pill recovery drive, held in May, brought in 96.6 pounds of expired or unused medications, totaling more than 50,000 MEM. “The mission of these pill drives is to start a dialogue, enhance understanding of the problem and get the attention of policy makers to start asking questions about why it is so difficult to safely dispose of opioids,” Brummett says. The team is also in discussions to partner with Michigan’s robust network of Continuous Quality Improvement programs funded by Blue Cross Blue Shield of Michigan. The Michigan Surgical Quality Collaborative, for example, includes the 73 Michigan hospitals that perform major inpatient general and vascular surgery procedures. This network of relationships and data infrastructure offer a unique platform for gathering data about post-operative opioid use, which is difficult for surgical teams to track after patients leave the hospital, as well as for implementing new initiatives for creating change on a statewide scale. That tension is present in stories about teenagers who have died too young, and brothers, sisters, parents and friends who could have had so much more time. It’s evident in every new statistic that tallies up the latest tragedies. But somehow this tension seems necessary. It is the same tension that drove solutions to Polio and AIDS and other public health epidemics throughout history. And it will continue to push and pull us toward change.